As I mentioned some years ago, improvements in espresso equipment or technique often reveal something new about the tricky coffee. Like Ukranian nested dolls, open one and, ha, there is another tiny doll. In the case of temperature-stabilized machines such as the Synesso or LaMarzocco we can see now that flow rate, the speed at which the espresso flows, acts exactly like temperature on the coffee. Fast pours, under 25 seconds, are sour just like under-temperature brewing water, and slow shots 28 seconds or more, are hollow. We kind of knew that….but the degree of sensitivity is what is so surprising. 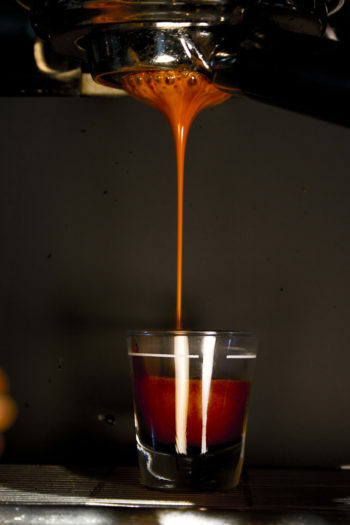 At Vivace we pull shots in 25 to 27 seconds to reach our target volume. (Remember, establishing your own volume is an artistic choice you make for your self at your own bar, but Vivace’s double is just under one ounce now. Did someone say “ristretto”?) Within the 2 second window there are dozens of distinct espresso coffee flavor profiles, none of them defective. In a balanced shot of Dolce I am tasting caramel, dark chocolate, leather/salt, blueberry, and toast. Depending on almost undetectable changes in the flow rate for the shot, different flavors vie for dominance. A little slower shot has more caramel. Another shot may feature more unsweetened dark chocolate or be more on the leather/salt note. Only the most balanced shot reveals the toast note. . (the notes…the notes…I must have the notes in the cremas….”The Coffee Experience”, you tube, OMG). Anyway…what effects flow rate? The grind of course is first and foremost. Not only the coarseness but the particle mix. (See micro-particle blog). Packed volume for the shot- dosage. (This is one of the things we work at the hardest at Vivace). Pump pressure. On almost all machines there is one pump for all three groups. So as you activate group #2 with one running pressure drops 1/2 bar or more. Mark has created the Synesso Hydra, his new machine with a dedicated pump for each group head, eliminating the problem. However, you should still operate out of a static water tank to eliminate changes in the incoming water pressure which will be passed on through the pump to the coffee.